Ideological undercurrent: the context of the Ping Melody concept and creation. Technical information about the Ping Melody live performance. Audio and video records from selected live performances. What is the Ping Melody? Ping Melody is a music-net-performance. Temporary and unique state of all actions of Internet users has an influence on form of music composition. 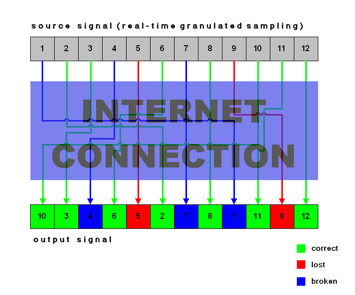 Musician (instrumentalist or singer) is playing on acoustic instrument/singing and sounds coming from instrument/voice are shared in packets of data information (granulated), then transmitted to selected Internet locations (as "ping" unix command). The order of packet's return, packet's delays, transmission errors alerts are incorporated, and the information coming from these actions is controlling in the real time the transformation of played sound. Performance will be accompanying by visualisation, showing tracks of data and information of errors, etc. Dedicated software is a kind of sampler (granular synthesizer) and pitch tracker, which is using Internet to transform and create sound construction. Musician is improvising, treating software, which is transforming sound coming from his instrument, as a partner - a kind of second musician. 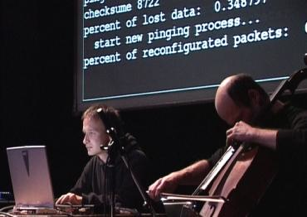 Most of net artists are using some specific possibilities of Internet: they are working with WWW, streaming, etc. In Ping Melody I treat Internet not so much as a tool which functions in given way, but as a space, that can be observed. I am specially interested in some sub-possibilities of Internet, that are growing out of simultaneous activity of huge count of its users - mental space, although objectivated: map od data transfer as a dynamic sum of actions taken by net users. In various philosophical and theological schools or traditions there is an idea which describes universe as a composition of ideal component (that is not the subject to inspection) and material component (on the observation we can draw the conclusions of first one). This kind of probe has got a long tradition in the history of philosophy. In Ping Melody - sending sampled sound in net and receiving signal coming back from some server - I can conclude about processing from the audible differences between source and resulted signal. In performance I use single instrumentalist and sound of acoustic instrument in opposition to collective character of scanned dataspace. Masterly acoustic instrument play in connected on one hand with technical perfection, and on the other - with ability of giving an individual tone to uttered sound. In case of musicians dealing with improvisation, it is also connected with ability to react on occurring changes and to compose them in own sound form. This ability is particularly important in Ping Melody: music improvisation is created here in relation to unique, temporary entirety of world's information exchange, that's why only aware catching its characteristic points by musician (or rather characteristic of processes at a given moment) makes possible creation of sound form, consisted of some more than only mechanic reproduction of caused by net distortions, reflecting on source sound material.